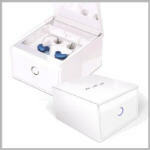 Renewable silica gel dessicant kit that removes moisture from hearing aids. CAUTION: Remove batteries from hearing aid before using kit. Features: Bactericidal & Fungicidal, fresh mint scent Contains 30 individual packs. Refills for the SafeTouch™ Cleaning Kit.. Contains: 20 cleaning tablets.